Link is ready step back into the wild! Beautifully crafted 10-inch tall statue. Based on Nintendo's The Legend of Zelda: Breath of the Wild game. Link takes aim with his Traveler's bow and Guardian arrow. Comes packaged in a collector-friendly themed window box. After a 100-year sleep, Link is ready step back into the wild! Based on Nintendo's The Legend of Zelda: Breath of the Wild game, this beautifully crafted 10-inch statue breathes life back into the legendary hero. 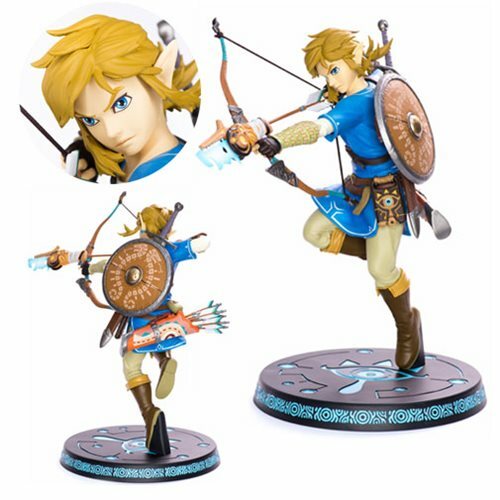 Made from high-quality PVS and ABS, the pre-painted figure features Link taking aim at his next enemy with his newfound Traveler's bow and Guardian arrow. With the Sheikah's Slate by his side, Link is ready to explore this new world and take down Ganon once more. The Legend of Zelda: Breath of the Wild Link Statue comes safely packaged in a collector-friendly themed window box. Ages 15 and up.